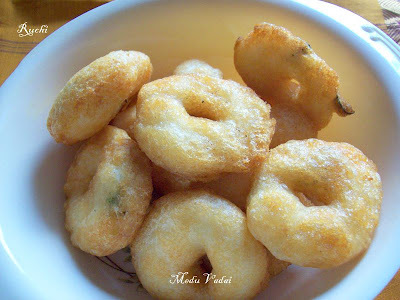 Thayir Vadai or Curd Vada is a very popular South Indian Snack Variety, based on curd. . It is typical Tamil style is made by soaking the vadais. The taste of vadai is soaked in the coconut and curd mixture and gently seasoned with mustard, curry leaves and red chillies.Its little spicier than Dahi wada. But it is very delicious. . There is not one person who could resist the taste of these yummy thayir vadai. It is usually made on festival occasions but as it is loved equally by kids and grownups. This is a traditional tamil recipe and is served on most important occasions and festivals. Since my family loved Thair Vadais, I prepared them quite often, . Thayir vada is one of my all time favorite snack! Beyond South India, dahi vada is famous. Dahi vada, where the curd was saturated with sugar, dipped in sweetish,salty, spicy curds garnished with roasted cumin powder, chili powder and Date-Tamarind sweet and sour chutney. is another popular national item. 1. Soak the urad daal in water for 30 to 45 minutes. Grind the dal along with green chilies, asafetida, and salt in wet grinder adding a tablespoon of water now and then and grind till it becomes fluffy. 2. Keep batter aside for making the Vadas.Grind the coconut with the chillies, mustardseed and mix these with the curds, adding a little salt to taste.3. Heat two teaspoonfuls of oil and one teaspoonful of mustard seeds. When the mustard seeds begin to splutter, remove from fire and add to the curd mixture. Add curry leaves and stir well. 5. Remove the deep fried vadais and drop them into a bowl of warm water and place them in it for about 10 seconds Remove Vada from water and gently squeeze out water by pressing between your palms or by spoon. 6. Now add this Vada into the curd mixture covering them completely garnish with spluttered mustard seed sand coriander leaves.. Keep for half an hour before serving.Enjoy the delicious Thayir vadai! Happy pongal wishes to u and ur family Akka..drooling over that thayir vadais..